Based in Italy, Cineca collaborates on a wide range of academic and commercial research projects across Europe. 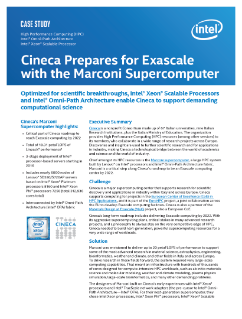 Using Intel® Xeon® Scalable processors and Intel® Omni-Path Architecture (Intel® OPA), Cineca’s Marconi supercomputer helps drive new insights through numerical simulation and computational science, which yield advancements in material science, astrophysics, engineering, bioinformatics ...and weather, and climate. Todd English shares how Intel® Xeon Phi™ processors help model and optimize engine performance. David Cassell of NAG shares how the NAG library for Intel® Xeon Phi™ offers performance benefits for a variety of sectors.